Dharamshala, India, 1 July 2006, TibetNet: [Peace Councilor] Prof. Samdhong Rinpoche has won the final round of election again for the second time with a landslide majority of 90.72% of the total cast. A statement released earlier today by the chief election commissioner of the Central Tibetan Administration said that "We are pleased to announce that in accordance with Article 69 of the Tibetan Election Regulations, Prof. Samdhong Rinpoche Lobsang Tenzin has been declared re-elected as Chairman of the Kashag (Cabinet) of the Central Tibetan Administration of His Holiness the Dalai Lama for the second consecutive term." 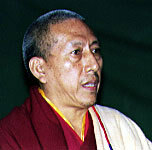 Of the total 32,205 votes cast in final round of election held on 3 June 2006, Prof. Samdhong Rinpoche got 29,216 votes and Kalon Trisur Juchen Thubten Namgyal got 2,989 votes. The counting was completed yesterday morning and the result was then presented to His Holiness the Dalai Lama. The date for oath-taking ceremony of the new Kalon Tripa will be set later.